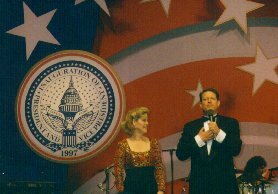 My then-wife and I were excited about attending the DC Inaugural Ball, which we heard would be one of the largest and most well attended of the fourteen official inaugural balls taking place in DC that night. These tickets were the compliments of PBS Online and the Presidential Inaugural Committee, who were thanking me for the work I had done on the Inaugural Classroom. The other balls that might have been interesting for us to attend were the Maryland Ball and the Youth Ball, also known as the 21st century Ball. 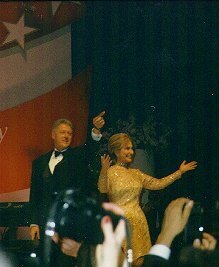 This was rumored to be the ball attended by Chelsea Clinton, and it was the ball that was described by the winner of the PBS Inaugural Speechwriting Contest, Alexandra Liechtman, who reported her inaugural experiences to the world via laptop computer and digital camera. It would be interesting to compare her experiences at the ball with ours. Judging by her photographs, it looked like she had the same trouble getting close to the stage as we did. Planning on attending an inaugural ball in 2001? Read one teacher's tips for inaugural ball survival. If only I had known! We arrived at the DC Armory about 8:00. Teresa and I knew no one there save one or two Inaugural Committee personnel I had met while developing the PBS inaugural lesson plans. For about two hours, we milled around the crowd, compared styles, and kept our eyes open for anyone of importance that we could claim we came near during the course of the evening. A drink was $4.00, and the food was weak. Sitting down was an impossibility. Toward 10:00, we moved toward the stage where the 80's band Meatloaf was playing. The aging band put on a pretty good show, and I was surprised to hear so many generation-X-ers singing along with the classics such as "2 outta 3 Ain't Bad" and "Paradise by the Dashboard Lights." The ball was being carried live by a number of TV stations. I was able to chart the progress of the First Couple as they appeared throughout the night on a small TV set in the press area. It was about 11:30 when Meatloaf introduced the vice-president and his wife. I had been slowly moving toward the stage by squeezing into the crowd that had massed next to the stage. The vice-president seemed quite animated and relaxed while on stage, quite the contrary to the reputation that he has for being stiff and wooden. As he spoke, someone in the crowd next to me fainted and fell to the floor. I tried to help by waving air on the poor soul, and I suggested her boyfriend splash some of his drink (beer) on his date's face to revive her. The crowd was so thick that it would have been impossible to carry her out of the thick of it and into the open air. While a sense of relief came over me that Teresa was perched on a chair near the press area and away from the "madding crowd," I was experiencing a moral dilemma as I wanted to help the fainting victim while wanting to snap my camera in order to record history. What would have been your choice? 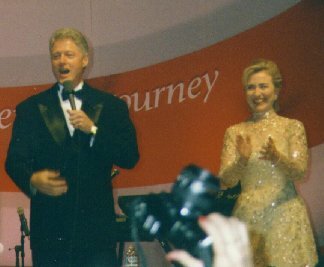 After addressing the crowd, he engaged in short dancing sessions with Tipper and then exited briefly until the President took the stage with Hillary at his side. Of course, he thanked us for returning him to office and helping him build a bridge to the 21st century. It is the dream of every American to meet the president of the United States. When I was given the chance to work with PBS Online on the Inaugural Classroom, that was the not-so-secret thought constantly running through my mind. As I researched and wrote about the life, office, and accomplishments of William Jefferson Clinton, I felt as though I got to know him a little better than I did before. The arch of his life became more apparent to me. The fact that we were able to witness his inauguration brought our lives together in some distance and indirect way, but it appeared that this experience would be the closest I would come to meeting him in my lifetime. If my students read this, they will probably be able to identify my political affiliation in spite of my efforts to mask them by remaining objective in class. Oh well. On the World Wide Web, there is no hiding. I would like to offer a special thanks to the staff of PBS On-line and the Presidential Inauguration Committee for making these experiences possible for my wife and me. Thank you for allowing me to be a part of our nation's history.